You are here: Home / Damp / Damp Specialist or Anti-Damp-Specialist Damp Specialist? Thank you for looking in Paul – I appreciate your input. I’ve looked at your site from a damp specialist view and there is lots of great information there – well done. (for those who don’t know Paul he replied to another post and raised a point about the moisture meter debate… here). Salty and dry – how can that be? Your premise that there are two parties in a debate about these meters and that both have merit, is a not something I agree with. I think that the whole debate has been hijacked by a narrow but vocal minority, who have identified a real problem, with these meters being used unethically, but have then grasped a business opportunity and used the meter as a red herring, to serve their own commercial aims, leaving aside the ethics and focusing on the meters themselves. Let me explain this. In the UK there has been a long tradition of surveyors allowing damp specialist firms (like me), to act as the specifier of work and the guarantor of work. 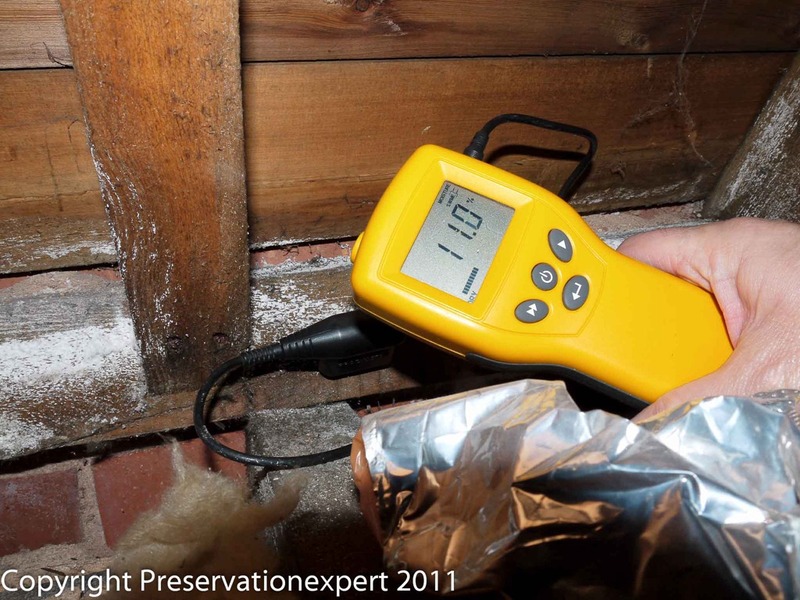 In insisting on a guarantee some damp specialists have had a field day in the past, recommending invasive and sometimes unnecessary damp proofing work, usually justifying the recommendation using an electronic moisture meter. Lots of money has been wasted and consumers ripped off (though a great deal of valuable and good work has been done also). This is self-evident. It is the result of the daft system we are stuck with here, which means that anyone can just set themselves up as a damp specialist and are fed a constant supply of vulnerable consumers, who are almost forced to use them (I am one remember). There are good damp specialists and there are bad ones – they all use electronic moisture meters of course. The Property Care Association has tried very hard to ensure that those damp specialists who want to learn and have high standards prosper, over those that don’t, but the system is still in place. Honest and fair-minded people don’t like the system (I don’t), but the meter we all use has little to do with the problem, if anything at all. The problem is one of ethics and lack of supervision and control. You and I both know that only a basic knowledge is needed, along with a little practice, in order to use an electronic moisture meter correctly. A good understanding of buildings and building materials, along with experience and some initial training is all that is required. Those professionals who recognise the problem have tried to bring about change; sharing knowledge; raising standards and consulting with the various parties (in the UK that is PCA, RICS, SPAB and CIOB among others), to bring about change. It’s easy to get hot under the collar – I get that way sometimes too (one of my pet hates is the ‘toxic mould’ bandwagon – I rant about that one a lot). The scale measures weight not damp – but the weight difference is water; Hygroscopic and capillary. However, of late I have come across a worrying manifestation – the rise of the Anti Damp Specialist Damp Specialist (ADSDS). These guys feed off the natural indignation right-minded people feel about the whole damp-proofing problem and they see a chance for fame and money. The fame is easy – they are just very vocal about highlighting the well-known problems of unnecessary damp proofing work. The money though, is the real goal and this is why I use the term ADSDS. These are the letters they should display after their names. There is heavy irony here; they are so damning and vocal about the misuse of electronic moisture meters and ‘damp specialists’, yet they uniformly use the exact same methods of marketing and bamboozlement, which the real cowboys use; Fear – Misinformation; Reliance on gadgets and loud promises of honesty, whilst saying everyone else is dishonest and incompetent. Obviously this is garbage and the evidence to the contrary is clear and irrefutable. But it has a tiny ring of truth and is attractive, if you’re a layman who’s read one or two media blogs and likes conspiracy theories and the X-files. Electronic moisture meters are useless! Another howler – to back this up they’ll sprinkle a few choice sentences in, such as “FACT – they measure electrical resistance not moisture” – “FACT – I put the meter on my head and it beeped – does that mean I have rising damp?” and even… “FACT – salts set them off not damp”. Sorry for the capital letters Paul, they use them a lot – along with italics too, using self-righteous truth to sell a lie, is well trodden marketing flim-flam . These are lies disguised as facts. How so? Well let’s think about the reader of these sites. They are worried they will be conned by the bogeyman that is the damp-proofing industry. The best action they should take, to avoid this would be to do good homework and stay rational and sceptical. Get good independent advice – make an informed decision, maybe get word of mouth recommendations? The ADSDS does not want that. So he will feed the reader with these emotive sentences, to try to validate the reader’s scepticism, reinforce it and at the same time close the sale. You need a thermal imaging camera to diagnose damp – ventilation will cure all damp. The blue areas a cooler – the temperature is the ‘apparent’ temperature not the ‘actual’ temperature. These two are quite new. That’s because the ADSDS’s have realised they need to differentiate themselves from real damp specialists some more. That means more gadgets. In trying to destroy the reputation of the humble electronic moisture meter (you could say it was the flashy gadget of it’s day), the ADSDS copies the tried and tested solution to bamboozling clients – get something flashy to validate your (pre-decided) recommendations! In addition PIV units are big business in the UK now and they see a quick buck here and can recommend these whilst staying ‘on message’. I own a thermal imaging camera, a carbide meter, a gravimetric lab and an electronic moisture meter (or three). And yes none of them measures neither damp, nor salt content or even temperature. What they can do is help a surveyor by giving indications of these things…. The sale I alluded to earlier. This being the over inflated ‘special’ survey – pricey telephone consultation – Positive Pressure Ventilation unit or, a quote for some lime pointing, plastering or rendering (at a vast mark-up). The sale will probably include a number of the above items. At worst for the ADSDS the reader may ‘click-away’ from the web site, but these ADSDS’s will even carry google adds on the site, (for the very damp proofing specialists and manufacturers they assert are cowboys), so that hopefully they can make a few quid just from the visit. Sorry for the long essay Paul – I hope you see why your wonderful electronic moisture meters are being attacked – it has nothing to do with the meters – it’s all about the money. The products you sell are useful tools. Good luck with the site Paul. I understand your concerns (and ranting 🙂 ) about the ADSDS. I live in Sweden now, but am originally from England. I think there has always been concerns and doubts regarding the building industry and peoples associated with it in England. Ever since I was a nipper and Ester Rantzen was on the box (that’s a few years ago lol) about rogue builders etc etc there has always been a cloud hanging over the industry. The general populous though are more wise now. Moisture meters have been around a long time and are here to stay, as are reputable and trustworthy workers within the industry. Fly by nighters drop in but are soon discarded. I don’t know if you will get any traffic from my website in the future, but ive put you on my home page and a link to your site.. You certainly know your stuff and for anyone with damp or moisture issues, you should be first port of call in my opinion. You really are a cosmopolitan chap – I assumed you were a yank… sorry. Thanks for the back-link and kind comments. I try to be as helpful as I can to clients and always make sure that they know I am a contractor, so that they can sift out any unintended bias. I am sure you note that the ADSDS are those that never measure/evaluate anything. However, they seem to feel free to comment on all and sundry, and provide references to some very dodgy information. They also seem to think that we are all stupid and need to tell us about moisture meters, etc. The real problem is that they have no sense to realise they do not know/understand everything. The important thing is to ‘know what you don’t know’ if you see what I mean – if one can appreciate this then one is on a winner, hence my lovely day with you to see how a REAL surveyor works!! Thank you. I feel a bit guilty writing a post with some negative stuff in but it galls me that the Heritage sector think they are immune to sharp practice and commercialism – there are bad guys in every industry and we should root them out whenever we can and praise good practice when we find it. Just because a consumer hears or reads- “independent” or “traditional” or worse still “Green”, they shouldn’t let their guard down – the speaker or writer may be just as bent as the ‘damp specialist’ they were warned to avoid… he’s just using language to gain their trust and make a sale! Great piece Bryan, I was asked only yesterday if I could to a speedy meter damp test to 3 walls on a property, I then had to explain how long this would take and this would give the total moisture content so 2 lots of samples will be needed which would result in a huge cost! When I explained about the gravimetric method and how much quicker and more accurate it is they couldn’t believe it…… they had been educated by a Mickey Mouse video on you tube by the ADSDS. They also asked if I could take a damp reading with a hygrometer behind the paper…. this was also on some video!!! Yes you are right of course. Some of the independents turn up, take a carbide meter test (yes – one sample) and then contrive a suitable diagnosis based on the results they find…. whatever the result, it will not be rising damp because they’ve nailed their options shut against all the evidence that, SOMETIMES rising damp is a problem. That’s not being independent it’s being incompetent and is playing fast and loose with consumers money and property. When I obtain a profile for gravimetric testing (very infrequently as it is just not necessary most of the time), I take at least 6 to 8 samples per profile. 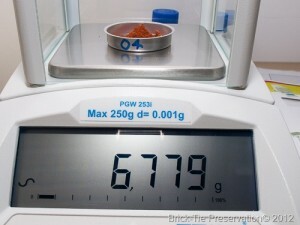 These are tested simultaneously via the gravemetric method, outlined in BRE 245. Doing the same with a carbide meter is fine, but the carbide has to be used to test them consecutively – it takes ages. Good luck to anyone who does this; they are usually independents and maybe have the time. Those who rely on one or two carbide samples are just using the carbide meter as a bamboozle meter – it’s shiny and complex and the client thinks they’ve had a ‘special’ damp survey, but without a profile not very useful. These ADSDS’s love their gadgets – but don’t use them properly. Good solid independent damp surveyors who are members of the Property Care Association are not ADSDS’s and are a far better bet. All the best Ross – see you on the thermography course. Well written article. I think many people believe there is a majic bullet somewhere in diagnosing dampness issues. There is none! We do have the benefit of recognizing patterns of behavior. But, to your point, we need to be armed with whatever tools are appropriate for the many combinations of problems we see. The human spirit is wildly varied and that reflects the many problems we see. Every house reflects every minor mistake made throughout history ; eventually. This is altogether different than water being sucked from the ground. At the roof level, I have learned to combine synthetic materials to allow air to pass through roof terminations and coping flashings ( both for metal and stone ). The action of wicking is fairly underestimated. It’s the same as taking your finger off the top of a straw. Just for kicks, fill a glass half way with water. Seal the top and stick a straw into the glass. Don’t submerge the straw in the water. Let it hover just above the water. You may be surprised how the water evaporates from this container. Well, this is how I’m treating my projects. There is a lot of development needed in this arena. The industry mostly knows only to seal the building from water getting in; not from getting out. So, whomever reads this post, please understand there is no majic bullet. We do need a variety of electronic tools. We need to recognize proper combinations of compatible materials. As a cooperative team, we must band together to develop ways to stop the degrading of these buildings. Thank you again for all of your efforts to improve upon a difficult situation. One last thing, I find many consumers spend thousands on repairs that never work. It’s a shame! I get referrals from local surveyors who completely miss the boat on recognizing and recommending proper solutions. I wish they would put their egos aside and open their eyes to what’s in front of them. It’s almost more important to understand what you don’t know! Bob Kelly- the Yankee in the group. We are just individuals searching for for a solution to some water entering a small part of one room of our 18th century cottage (Norfolk brick and flint). It only occurs after it’s rained. We read with more and more confusion about reasons/solutions and understand we need a reliable expert in to help. Where do we find one ? We have avoided the “dap specialists” listed locally as we suspect they will want to introduce expensive “cures” which may not sure at all or be unneccessary. We have started to look at these liquids/creams you can apply that are alledgedly water repellant but allow moisture out. Who can really advise us about these please? sorry if this is not really the right forum to ask this question but we are going round and round in circles. So even a place to look would be helpful. Many thanks. Thanks for looking in. Before we go any further I would recommend this old post The very basic guide to damp part 1 – and the following parts 2 and 3. I designed these to give you some basic knowledge. Flint is not porous so will never need application of a water repellent. The bricks and mortar beds may be, but if the damp is confined to one room and one area that suggests a localised issue, unlikely to be related to porosity, otherwise the area would be larger. Sometimes driving rain from a south westerly direction can be a problem and StormDry water repellent cream is great for that. However, these treatments are no substitute for good maintenance so check the pointing, the gutters and such first and if there are defects fix them the old fashioned way first. Don’t rule out condensation or salt damp, these can become apparent when it rains, just due to the high humidity so check the kitchen and bathroom are well ventilated (I know that the effected room is not those but honestly, water vapour is very invasive). For local specialist advice use the Property Care Association web site to find a contractor of two to look it over. If you are unsure about their advice don’t follow it and get an independent surveyor from the same web site. Read the guidance I have written to arm yourself so you will know if the advice doesn’t add up. Despite the tales of woe, the vast majority of specialist are honest hard working folk just like you and I, so give them a chance but do think for yourself – does the advice sound right? Is there a sensible methodology backing up the advice? Sorry I missed the post in my moderation list…. if you are getting a reading of 12-16% with a ‘pin’ type meter that is low enough to discount as zero – these meters are very sensitive. 21-26% in ‘new’ wood is a worry because it implies there is a moisture source – humidity or direct. What is the cellar ventilation like? Any surveyor, seeing new joists in an old house will immediately be ‘on notice’ because people don’t just replace floors for nothing. Something happened and it needs to be established that the cause of the previous problem, whether dampness or not, is found and identified as rectified. A damp and timber survey will be needed. get a PCA member and watch him – talk to him and see what he does. Make sure that all his recommendations, if any are made, follow his findings logically. It’s not good enough to say – high readings equals a new DPC – that is almost always wrong. As I said in my post watch out for those who make money from telling you what you want to hear – by and large this new breed of self-styled damp experts are quacks, who are as bad as the worst damp-proofing cowboys.